The projection box at the A.B.C. Piccadilly cinema, Birmignham in 1952. Visible are two Ross projectors with enclosed spool boxes as required by law when handling nitrate film. A 1928 advert for the "Hahn" Zeiss Ikon projector, including itemised diagram. Until the 1950s, movies were projected from film with a base made from cellulose nitrate. Nitrate film was highly flammable and would burn under water. As a result stringent safety regulations were put in place in rojection boxes across the world. 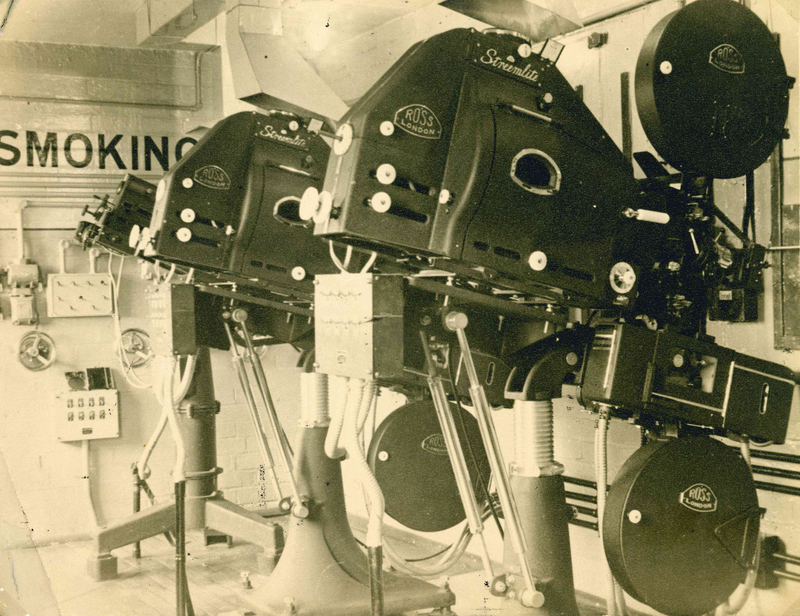 In the UK, regulations included the necessily for a separate rewind room (where the film would be prepared), a large team of projectionists and a maximum spool capacity of twenty minutes. This meant that projectors came with enclosed spool boxes to make it impossible for projectionists to beak the law. This can be seen in both the photograph of the Piccadilly cinema (left), and the advert for a 1928 Zeiss Ikon projector (below), which also itemises a number of other safety features. The limitations placed on spool capacity and the need for enclosed spool boxes meant that feature films had to be projected using two projectors, moving from one to the other every twenty minutes, at the end of each reel. The move from one projector to the other was called a change-over. In the audio clip below, Mike Williams describes the process of changing-over from one projector to another. ← Changing Technology; Changing Work.